In the case of NIF, the money can be traced back to the Ford Foundation, which Black described in a previous monograph entitled 'Financing Hate,' published by the JTA. Henry Ford's anti-Semitism has been much explored, as he was a major promoter of the forgery 'Protocols of the Elders of Zion" during his day, which did more to vilify Jews than most any other document in modern times. In the 1970s, Ford heirs left the board of the Ford Foundation, which then divested from its holdings of Ford Motor Company stock. While the foundation has supported many notable endeavors, Black recounts how its money went to the type of anti-Israel and anti-Jewish programs that Henry Ford would have supported. During the first years of this century, [the Ford Foundation] abundantly funded a notorious international hate campaign against Israel, Zionism, and the Jewish people. Through its Cairo office, just during 2000 and 2001, Ford extended more than $35 million in grants to some 272 Arab and Palestinian organizations plus 62 grants to individuals that totaled more than $1.4 million. Beginning in the 1950s, the foundation's Beirut and Cairo offices awarded more than $193 million to more than 350 Middle Eastern organizations,almost entirely Arab, Islamic, or Palestinian. From 1948 to 2003, the foundation also gave some $50 million to Israeli organizations and more than $40 million to support the larger Jewish community. During 2000 and 2001, Ford-funded hate speech, enunciated under the rubric of the UN World Conference against Racism, shocked even seasoned observers of anti-Semitism. After more than a year of preparatory conferences held in Iran, Switzerland, Chile,France, and Senegal, it became clear to Israeli officials and Jewish organizational leaders that Palestinian nongovernmental organizations, or NGOs, and their allies had manipulated the agenda of the UN World Conference against Racism held in Durban into a focused indictment of Israel as an illegitimate apartheid, colonial, and genocidal regime. The proposed language of conference resolutions would deny or dilute the Holocaust and espouse an openly anti-Semitic stance... what then-US Rep. Tom Lantos (D-CA), a member of the American delegation to the conference, termed "a transparent attempt to delegitimize the moral argument for Israel's existence." Black's reporting for the JTA led to a public outcry in October 2003, when 21 Congressmen, led by New York Representative Jerrold Nadler, signed a petition to Ford demanding that the tax exempt charity cease and desist funding hate groups. Shortly thereafter, Ford Foundation president Susan Berresford met with Jewish communal leaders. Ford issued a letter of apology. New programs were enabled with traditional American-Jewish communal groups such as the Anti-Defamation League. Foundation funding was withdrawn from the spotlighted groups and, indeed, nearly all Israeli-agitation groups. Careful new grant standards were adopted to avoid funding hate speech or groups openly verbalizing support for terrorism. At the same time, Ford Foundation announced that it was creating a totally new pool of money, to be known as the "Ford Israel Fund," to be channeled into an organization, lesser known at that time but with a very Jewish and Israeli name. That organization was the New Israel Fund. Two $20 million, five-year commitments to NIF were made by the Ford Foundation. The Ford Israel Fund was the name created as the vehicle for the infusion. Ford states that its intent at the time was to stop making grants where it did not have a field office on the ground—a change that ultimately affected both its Israel and Eastern European activities. What Black's research shows is that many of the groups funded by NIF follow the same anti-Jewish sentiment of the previous round of Ford grantees, potentially because of the same staff member from Ford now working directly as a "consultant" for NIF. The Ford Israel Fund, which for a decade has constituted a backbone of the NIF's financial muscle, is a foggy entity that has confused many and, as of this writing, is still broadly misunderstood and misrepresented by those who are the recipients of its monies. Ironically, from its outset in 2003, the Ford Israel Fund was overseen by the same staff individual who ran the Israel programs at the Ford Foundation during the debacle chronicled in Funding Hate. Three key stipulations were woven into the $40 million Ford grants: 1) Promote civil rights and human rights in Israel. 2) Promote equity and equal opportunities for the Palestinian minority within Israel; this included "strengthening the ability of the minority community to organize, advocate, and press for changes in public policy and law to improve its status." 3) Promote "a peaceful resolution of the Israeli-Palestinian conflict." More precisely, spending in this third category was to support activities to get the peace process back on track. In his criticism of NIF, Black points to the good that many groups it funded have achieved for minorities in Israel, but points out that its most destabilizing programs are, in fact, dangerous for Israel. He also aims to make the case that as a non-profit organization, NIF is subsidized by the American taxpayer, so its actions should be more in tune with what Americans want to see in Israel. Instead of supporting the mission statement ascribed to the donated Ford dollars, including working towards supporting the peace process with the Palestinian Authority, NIF, he says, is making the situation worse. The New Israel Fund is comprised of social activists who want it both ways. They want every religious minority to be treated distinctly, just as those groups demand, in a way found nowhere in the Middle East, while adhering to a color-blind Main Street USA democratic and egalitarian system. Its capacity-building division, known as Shatil, identifies individuals or groups that do not know how to become a nongovernmental organization (NGO) or otherwise qualify. Shatil, which means seedling in Hebrew, trains uninitiated individuals and groups on how to raise tax-exempt money, deal with government regulations, and navigate the tortuous waters every NGO must traverse. Arguably, there are now thousands of Israeli social-action organizations directly or indirectly funded by NIF. The organization is mammoth, sprawling across all of Israeli society. Even the staunchest critics of what detractors assert are the NIF's extreme social-agitation campaign, concede, as one Shomron settler said, "They have done many good things—many good things. They help women and children." NIF vice president Naomi Paiss explains simply, "We are not about soup kitchens. We are about social change." But many critics in Israel charge that while the New Israel Fund poses as a grassroots movement, its grass is largely made green by American tax-exempt money. Indeed, NIF politicking might not succeed in the Jewish State were it not for the exorbitant funding by foreigners with an agenda to completely make over Israeli society in some other image. Most poignantly, the many scores of millions deployed by this international political behemoth are taxpayer-enabled and subsidized via a US tax code that allows charitable donations to be contributed tax-exempt to 501(c)(3) organizations. "Every $1 million diverted to 501(c)(3)organizations means approximately $450,000 that all other American taxpayers must make up to defray America's national and state budgets and debts," explained a prominent tax attorney specializing in exempt 501(c)(3) entities. Hence, when the NIF gets money to remake Israeli society, every American participates. Black is particularly harsh on two NIF grantees, B'Tselem and Adalah. He interviews Israeli political and military leaders who describe how those two groups, in particular, impact their work. B'Tselem undertook its own independent investigation of the 2012 Gaza operation, generally through third and fourth parties. B'Tselem lodged a series of twenty separate complaints with the Israeli military to conduct criminal inquiries. After evaluation, the Israeli military authorities rebuffed each claim, generally concluding that "no well-founded suspicion of violation of the Laws of War by any military entity had been found." In some cases, the military said the cases were inconclusive. B'Tselem dismissed the IDF's response as "inadequate" and issued its own report anyway, which nonetheless suggested that war crimes had in fact taken place. The B'Tselem's summary stated, "B'Tselem's report raises suspicions that the military violated International Humanitarian Law (IHL). Breaches of two major aspects of IHL are of greatest concern: lack of effective advance notice of an impending attack and an unacceptably broad definition of what constitutes a 'legitimate target.' The report analyzes nine cases in which Palestinian civilians were killed or injured by the military that raised suspicions of IHL violations." Black interviewed members of the IDF's leadership, including Deputy Defense Minister Danny Danon, Colonel Benny Yanay, General Avi Mizrahi and others who dignified the B'Tselem report with a response, though nearly all of the organization's facts were wrong, they said. Asked if he believed the NIF is working to destabilize the IDF, a senior officer in the office of the Chief of Staff, responded, "It is more than believe it. I know they are destabilizing the IDF." The senior officer was not authorized to speak to the media as a representative of the IDF. He continued, "One of our operations was Cast Lead. That was followed by the Goldstone Report. More than 90 percent of the references in that report are either to the NIF or its grantees. If we were actually committing war crimes, it would be one thing. But one by one, we proved these allegations to be false. In some cases, when civilians or uninvolved people got harmed, it was in spite of our efforts. Our information showed that about 60 percent of the 1600 killed were proven to be terrorists, and the remaining third were mainly an unanswered question." Deputy Defense Minister Danny Danon adds, "I will not mention specific names, but we know the names of all of them. They are not playing fair. In their agenda, they don't say 'we are here to bash the IDF.' They say they are here to provide information and do something positive. But that is a disguise. Their real agenda is to demoralize the IDF and to put second thoughts in the minds of every soldier. That is very problematic, because every officer must now second-guess his actions. We recently had a jeep attacked with stones. The soldier knows his actions will be videotaped and edited, and then he will have to defend himself in court." Colonel Benny Yanay fought at the front line as an ordinary officer. "The New Israel Fund," insists Yanay, "acts against Israel—against the soldiers of our country. It is important to me that people recognize the New Israel Fund for what it is. It is supported by foreign governments and organizations so that Israeli soldiers will be weakened." Yanay adds, "Their budget is more than anything we have—so it is not a fair fight. We are not a political organization. They are political." Yanay speaks for Consensus, an organization of three hundred senior Israeli army officers who, among other things, are deeply concerned about what they see as efforts to destabilize the IDF by the NIF and its grantees.The three hundred military officers of Consensus are unified in their belief that the NIF and its grantees, in spite of their public policy programs, are now a leading threat to the battle effectiveness of the Israeli Army, Air Force, and Navy. Consensus, and its Hebrew language website, tries to muster meager electronic resources to defend itself. But the volunteer officer group feels it is a losing battle—it feels outclassed by the media might of the NIF and its grantees. American taxpayers, vocal critics say, finance what more than one military man has called a "new front" against the IDF. A senior officer in the Office of the Chief of Staff phrased it this way, "What the NIF and its grantees have done is to create a new front for the military, and it is a major new front." His reporting was especially insightful in showing the frustration caused by NIF-funded groups that pick fights with soldiers to engender violent responses that can be caught on camera and used to further vilify the Jewish state. It generally works this way, say many Israeli military men: First, IDF soldiers are provoked by local Arab or left-wing Israeli agitators.The protesters are practiced at pushing all the buttons of these young soldiers, many of whom are not old enough to order a drink in an American bar. "The soldier's mother is insulted, as well as his country, his commander, and everything else he might care about; he is called a Nazi," complained General Avi Mizrahi, the recently retired top general in Israel's Central Command. Until last year, Mizrahi commanded all forces on the West Bank. In an interview, Mizrahi protested, "This taunting is done within just a few inches of the IDF soldier's nose, often closer. Then, when the soldier finally reacts either by pushing, arresting, chasing, tear-gassing, or cussing the provoker, B'Tselem volunteer observers roll their cameras. The pictures can immediately be shown in Berlin or on the Internet," says Mizrahi. B'Tselem spokespeople deny they are entrapping soldiers with calculated videos but rather feel they are ensuring that Israeli soldiers are as good as a vibrant democracy demands. While the B'Tselem volunteers themselves are rarely, if ever,engaged in the actual taunts and harassment, their friends, neighbors, and family members commonly are. In reality, the protesters are playing to the camera. Frequently, the taunts and harassment are not caught on camera—only the soldier's reaction. Critics claim the provocations are often edited out. Hence, the strategically omissive nature of the video and photographs often show only one thing: a well-armed, brutal IDF solider bullying a seemingly innocent, unarmed, and defenseless civilian. In the event of a riot—and in some villages they occur like clockwork every Friday, if not more frequently—ordinary crowd-control measures, such as tear gas, are part of the video record. The videotapes lead to international allegations against Israel, and military leaders, including General Mizrahi are made to fear international travel. "If I want to go to London for a few weeks," says Mizrahi,"I have to check with the legal division of the IDF to determine if I can go without the danger of being charged. I cannot even go to a NATO conference in Belgium, which is now a place where you can be accused of being a war criminal for just defending your country. They will indict you. Wherever I travel, I must check first to see if I am being sued." In an interview, Black told The Algemeiner that he thought the revelations from the book that would most surprise general U.S. readers and members of Congress were about the relationship between many donor funds, co-mingled with money from Saudi Arabia, that flow to the Palestinian Authority, which then uses the money to pay salaries to convicted terrorists in Israeli jails. His reporting cites the PA news agency Ma'an and published interviews with its Interior Minister, but he said that, in his conversations with Americans, many seemed to have glossed over the news or not grasped the context when originally reported. In December 2000, a few months after the onset of the [Intifada] riots, Arab ministers at a Cairo summit agreed to "economic decisions ... to support the Intifada," according to the semi-official Saudi weekly Ain-al-Yaqeen. Two multi-million-dollar funds were created to support the resistance: the Al-Quds Intifada Fund and Al-Aqsa Fund "to assert the comprehensive Arab support for the Palestinian people in face of continuous Israeli aggression." Their purpose was to support Mujahedeen—"freedom fighters"—and "martyrs," the term commonly given to suicide bombers. Dominant financial support for the twin funds was advanced by the Saudis, who announced, "The Kingdom of Saudi Arabia [has] always maintained its support to the Intifada." Initial contributions amounted to $40 million, chiefly emanating from Saudi Arabia and the Gulf States. Explaining who the recipients were, a Saudi statement read,"Financial assistance was disbursed to 28 families of the martyrs, 248 injured people," as well as "232 families whose houses were demolished by the Israeli occupying forces and 29 Palestinian charitable societies in charge of distributing food baskets to the needy people." Saudi officials added later that the funds had benefited "664 martyrs' families and 201 of the POW's [prisoner] families. "The Islamic Development Bank reported that "these families receive monthly allocations to ensure the minimum of their needs. "An Islamic Development Bank summary asserted that from December 2000 to June 2006, "total contributions to the Fund amounted to $609.4 million." That enormous sum covers all needs, from endowment building to identity-fortifying resistance efforts such as construction to financing a range of confrontations that span the gamut from ordinary riots to martyrdom. Monies channeled to prisoners and the families of martyrs are disbursed through both the Palestinian Liberation Organization and the Palestinian Authority's ministries, including its Ministry of Prisoners Affairs. While those contributions were clearly Intifada funds, separate tranches of funding from the same Islamic Development Bank were funneled into various charitable works via two major top line Arab NGOs: The Welfare Association and the NGO Development Center. Both the Welfare Association and the NGO Development Center also receive money directly and indirectly from the most prestigious donors in the world, such as UNESCO, The British Lottery, Ford Foundation, and many governmental units, often via the Welfare Association of the UK. Welfare Association and NGO Development Center funding also finds its way to several Israeli beneficiaries that are also funded by the New Israel Fund. These include B'Tselem and Adalah. Ironically,some of the same Israel-based recipients who receive American tax-subsidized grants from the New Israel Fund have been selected for support by the most influential sovereign Arab and Islamic charitable organizations representing national treasuries committed to erasing the existence of Israel. What many readers will be surprised by is the actual accounting Black reports from within the PA.
Amid the mélange of shape-shifting numbers and month-to-month tallies that rose and fell with various financial crises, shortages, and monetary infusions, it was clear that the Ministry of Prisoners is among the PA's most salient line items. For example, in January 2012 alone, out of a Social Service budget of $119 million, more than $8.7 million was allocated to the Ministry of Prisoners; of that sum, according to Table 6A of the review, $6.56 million was "transferred" to prisoners—hence the overwhelming majority of the budgeted funds paid were not for bureaucratic office expenditures, but for actual terrorist salaries. All told, funding for the Ministry of Prisoners was about ten times greater than the allocation for Ministry of Labor, and about half as large as that for the Ministry of Social Affairs. Another interesting part of the book is Black's investigation into the many fringe groups that do not necessarily receive NIF funding, but fit the profile of anti-Jewish groups fighting the state from within. The portrait painted of one, International Women's Peace Service, tracks their money from an Austrian bank to a false address in London, actually a vegetarian restaurant. He then tracks the IP address from which its website is updated to a computer in a trailer park in Spring Hill, Florida, where Black locates an IWPS leader, Marie, who tells him she is one of just 11 people who manage the group that directs some 150 women volunteers to do its bidding within Israel. In an interview, Marie responds to his question of, what is their mission? "It is like I said; we are not an NGO or a charity and not giving out food or anything like that. Our group is completely independent. We are here for protective presence." The term "protective presence" is shorthand for obstructive confrontation with security forces during high-profile actions. She added, "We resist the Israeli occupation, train the villagers, and we do field research. We go to the Friday demonstrations at Nabi Saleh." Undoubtedly, 'Financing the Flames' brings forward in one book many of the details about the non-profits that claim to benefit Israeli society, but that hamper the ability of the government and military to perform their duties by working, unknowingly or not, on behalf of those who oppose Israel. The book also shows what many supporters of Israel may have not realized; while the forces set against the Jewish state are many, the idealistic but rag-tag foot soldiers, such as Marie, in the Florida trailer park, can be countered by exposing the mechanics of the forces at work against Israel, and by revealing the truth. Joshua Levitt is Senior Correspondent for The Algemeiner, an international Jewish Newspaper. Levitt was a foreign correspondent for the Financial Times, based in Madrid, Spain, where he lived for six years. On sabbatical, he was a Knight-Bagehot Fellow at Columbia University, the youngest ever in the program. He reports from across the Middle East. 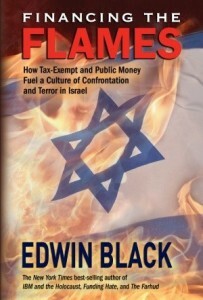 Edwin Black is the award-winning, New York Times bestselling international investigative author. He focuses on genocide and hate, corporate criminality and corruption, governmental misconduct, academic fraud, philanthropy abuse, oil addiction, alternative energy and historical investigation. He has appeared to speak, lecture or testify in three legislatures on social justice issues and is a frequent contributor to on-line publications as well as having his own weekly TV show on human rights and social justice.